A look at the LeBron Player Exclusives that Diana wore with the Mercury last season. 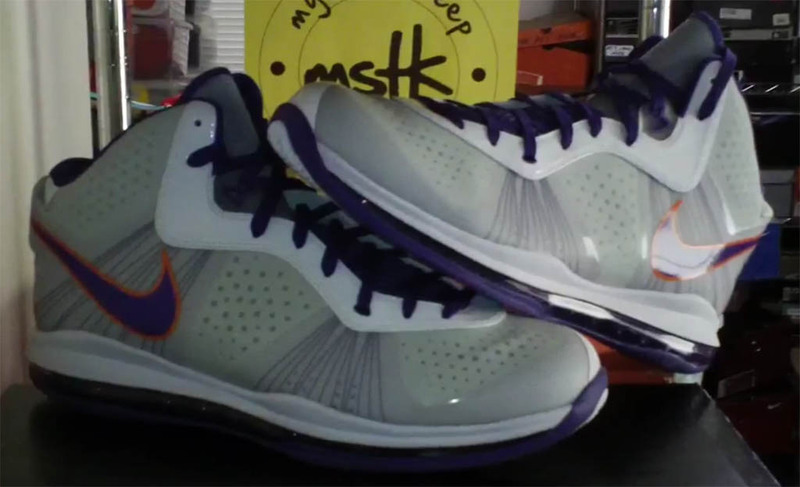 After giving us a look at Diana Taurasi's 2011 WNBA All-Star Game PE, our friend GotKickz from MySoleToKeep is back again with another Nike LeBron 8 V/2 video review. This time we're taking a look at Taurasi's Phoenix Mercury 'Home' LeBron 8 V/2 PE, which she wore throughout the 2011 season.The shoe features a white synthetic and patent leather upper with heavy purple accenting and minimal touches of orange on the lion's eyes and Swoosh border. Finishing off the look below is a purple Max Air bag and white outsole. These are exclusive to Diana and were never released to the public. Check out the video below for a more detailed look and be sure to bookmark MySoleToKeep for more rare sneaker reviews.